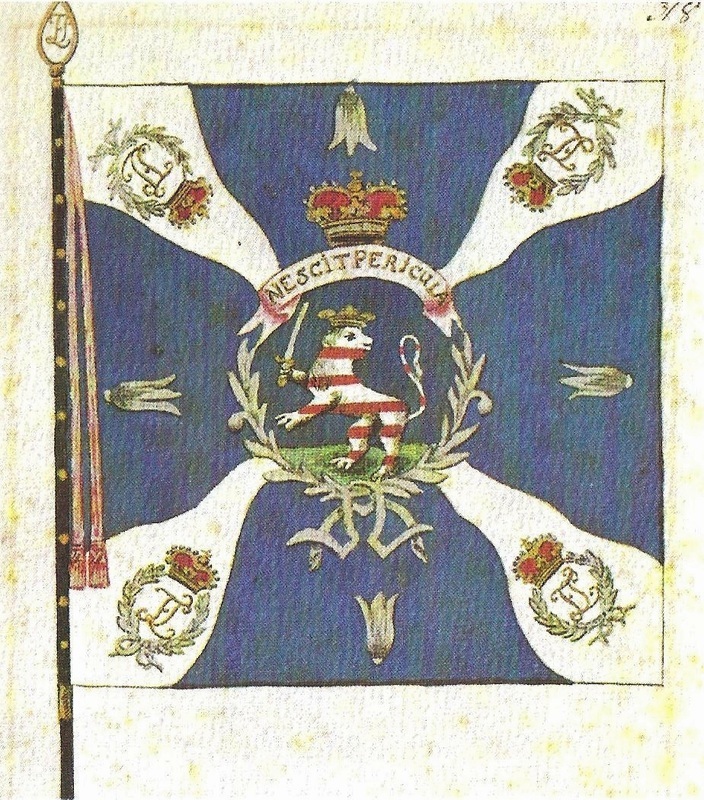 The 8th Hessian infantry Regiment was called two different names during the period of the American Revolution, von Trumbach and von Bose, respectively. In keeping with tradition, Hessian Regiments were named after their commander. The Regiment was commanded by von Trumbach until 1778 when Major General C. von Bose became the commander. Von Bose came from the German State of Hesse-Kassel and began their march from Hofgeismar on 13 February 1776 to the port city of Bremerlehe in the north. They then set sail on 23 March to New York on August 15th 1776. The Regiment arrived at Sandy Hook, New Jersey as part of a large fleet of troop transports with other Hessian units. The Regiment participated in numerous actions in New York. Von Bose transferred south in November 1778 and participated in the capture of Savannah, Georgia and the Battle of Stono Ferry, South Carolina. The Regiment also participated in the capture of Charleston, South Carolina in May of 1780. The Regiment was later assigned to Lord Cornwallis’s Army and participated in the Battle of Guilford Courthouse in March of 1781. The Regiment’s musketeers accompanied Cornwallis into Virginia. The German troops accompanying the expedition were the Hessian Jagers, Ansbach Bayreuth Infantry Regiment, Ansbach Bayreauth Artillery, Fusilier Regiment Erbprinz and the Musketeer Regiment von Bose. The following is an excerpt from the “Reports from Lieutenant-Colonel du Buy of the vonBose Regiment to Lieutenant-General von Knyphausen. In camp not far from Wilmington, Cape Fear River, North Carolina. to Hillsborough, where the Royal Standard was raised to salute of twenty-one guns as a sign that both provinces were conquered, after which Many came in from the environs with or without arms and took the oath of allegiance. we immediately left Hillsborough and marched out to meet the enemy. They retried as usual. It was not possible to pursue them because we were obliged to go to the nearest mills for want of food. General Green received a second considerable reinforcement of 3,000 men under General Steuben, consisting mostly of Virginians and the so-called Blue Mountain boys, all good shots, so that his army was now 8-9,000 strong. With this force, that was five times superior to ours in numbers, he thought he would be able to attack us. “Towards 10 o-clock our advanced guard came upon the corps under Lieutenant-Colonel Lee, which was driven back to the main body of their army. About noon we were near the enemy army and they began to cannonade us. As the whole country is covered with woods and forests, it was impossible to see the enemy, much less their position. The 71st regiment received the order to move into the forest to the right and to draw upen bataille. I received the order to do likewise and to form up behind the 71st regiment in order to support them. Immediately afterwards I received the order that the von Bose regiment was to draw up on the right wing in a line with the 71st regiment. The 1st battalion of Guards formed up behind the Bose to support us. After hastily laying aside our knapsacks and everything that could inconvenience a soldier, the 71st and von Bose regiments received orders to advance and attack the enemy in front of us. The 1st battalion of Guards followed the Bose regiment. We had not advanced more than 300 yards when we found a deep ravine in front of us with high banks and filled with water. We crossed it with much difficulty and then came to a fenced-in wheat field, on the other side of which the enemy, consisting of about 1500 Continental troops and militia, were deployed en ligne. We tore down most of the fences on our side and jumped over the others without, however, being inconvenienced by the enemy, although they were not more than 300 yards distant. I formed the battalion into line with the utmost dispatch and we ran to meet the enemy in tolerable order. They fired a volley but did not have time to reload so they took to flight. We sent a volley after them, jumped over the fences, formed the battalion into line and followed the fugitives at double-pace march; but the latter, profiting by all the advantages offered the ground, halted and discharged their guns at us. We dislodged them, however, every time. Meanwhile, the 1st battalion of Guards, which had been with us, advanced to the right wing of the regiment and now marched with us en ligne. As that part of the enemy army on which the 71st regiment had lighted, now withdrew also, and moved over to the right wing of the enemy pursued by the 71st regiment, there was an interval of more than a mile between the 71st and the von Bose regiments. “The enemy, who was fortunately no longer together, but who still did us much injury from behind the trees in the thick wood, took advantage of the above and surrounding our left flank, came on our rear, so that I was obliged to make the two companies on the left wing wheel around to the right In order to defend our flank and rear. The 1st battalion Guards, whose right wing was also flanked, lost many men and a little ground. of the regiment and Major Scheer returned with the second part of the regiment and rejoined the first part." Excerpted from Koch's account of Guilford Courthouse, in: Enemy Views: The American Revolutionary War as Recorded by Hessian Participants, comp., trans. and ed. B.E., Burgoyne (Bowie, Md.,1996), pp. 448-49. Koch had been recruited at the age of sixteen in 1742, and was a veteran of the Seven Years' War. See Atwood, The Hessians, p. 41. “Reports from Lieutenant-Colonel du Buy of the vonBose Regiment to Lieutenant-General von Knyphausen. In camp not far from Wilmington, Cape Fear River, North Carolina. “In this extremity I advanced with the three companies of the right wing, which gave the Guards time to form into line and advance. Hereupon the enemy, except for a few marksmen, left the field and withdrew further into the thick woods. Lieutenant-Colonel Tarleton, whom Lord Cornwallis had sent with a body of his dragoons to inquire how we were getting on, came just a’propos to rout the fugitives entirely, but had the misfortune to lose the two first fingers on his right hand by a shot from a rifle. “The 16thand 17th were passed in burying the dead belonging to both armies and making preparations for transporting the wounded among whom, however, there were 70 who could not be transported but had to be left behind in New Garden Meeting House with sufficient surgeons and drugs. “On the 18th the army marched back so as to be near Cape Fear River and open up communication with our ships. Although we had to march 220 miles in order to accomplish this and were burdened with more than 600 wounded and sick, the enemy did not even venture to harass our arriere, but pursued us at a distance as far as Deep River, where they are said to be still. “On the 21st our small army, much fatigued and in rags, moved into camp here, where we shall not remain long according to report, but are only to provide ourselves with small articles of equipment, so as to be able to operate for the next few months during which the heat will not be so oppressive. As far as I can judge from what Lord Cornwallis says, we shall return the same way we came so as to be able to approach Virginia and join the corps under General Philips and Arnold. This is only my idea. Your Excellency will be better acquainted with the plans of operation. “I do not think it possible to give a true description of the campaign we have had –how the men have suffered from hunger and what other hardships they have undergone – the whole would sound fictitious. I have the honor of enclosing hereby a list (Attachment C) in which the marches we had from Charlestown to here are marked as well as their lengths. I have not been able to note down a quarter of the many creeks, most of which have no names. I venture to commend Lieutenants von Leliva and Schwaner, who have held this rank since 1760, to your Excellency’s particular favor. On the sixteenth day we remained under arms in the trenches, and the cannonfire continued. The enemy sent a flag of truce inviting our capitulation. Lord Cornwallis replied that they had his conditions, and if they were bot acceptable, the negotiations were ended. The cannonfire continued until one o'clock on the afternoon of the seventeenth day, when the enemy fired the last shot. It killed the regimental drummer of the von Bose Regiment. Major Maximilian Wilhelm von Oreilly (O'Reilly) commanded 285 men of the regiment at Yorktown, Virginia. Soldiers from von Bose defended Redoubt #9 when it was attacked by French troops, and Germans, ironically in French Service, the Royal DuPonts Regiment, the evening of October 14th. At Yorktown, vonBose lost 18 killed, 40 wounded and 11 missing. The main body of the regiment went into captivity after the Battle of Yorktown. The Grenadier Company remained in New York and returned to Hesse-Kassel from there after the war.